Path is a free app that tries to do for video what Instagram did for photos—give users a way to make cool images on their iPhone and share them with their friends. The latest version of Path makes great improvements over the app’s shaky first iteration, but limitations remain. Special Effects: In addition to letting you share short video clips, Path lets you apply effect filters to give your videos a stylelized look. Path’s basic function is to let you shoot 10 seconds of video and then share it. The downside—aside from the 10-second limitation—is that you can’t pull clips from the iPhone library. The upside is that Path’s latest version includes Instagram-style effect filters to make your moving images more dramatic. Another improvement: those videos now upload much more quickly than they did in the first version. The latest version of Path also improves on the original release by letting users out of its walled garden—but only to a limited extent. Originally, videos could be shared only with other Path users. Now you can alert your Facebook friends to the existence of a video, but they can’t actually play the video in Facebook; instead, they have to get a Path account as well. The real question is why anybody would want to share a mere 10 seconds of video: iPhone video enthusiasts can already share longer videos on YouTube, and share them more widely. Then again, there was a time when microblogs limiting you to a mere 140 characters seemed ridiculous. 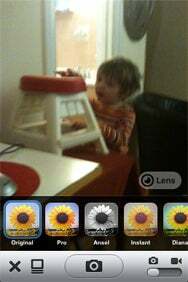 If “microvideos” are the next social media trend, Path is off to a good start.